Since 1966, the year I started growing my first mustache at the ripe-old age of two, The Grinch has entertained children of all ages every year around Christmas. Yes, my family owns the DVD. The fictional, animated character, created by Dr. Seuss, is the anti-Santa--the Scrooge of Seuss's poetic, satirical world. So iconic has the green creature of unknown, biological origin become that his name is now both a moniker for and a description of grumpy, stingy people--especially around Christmas. 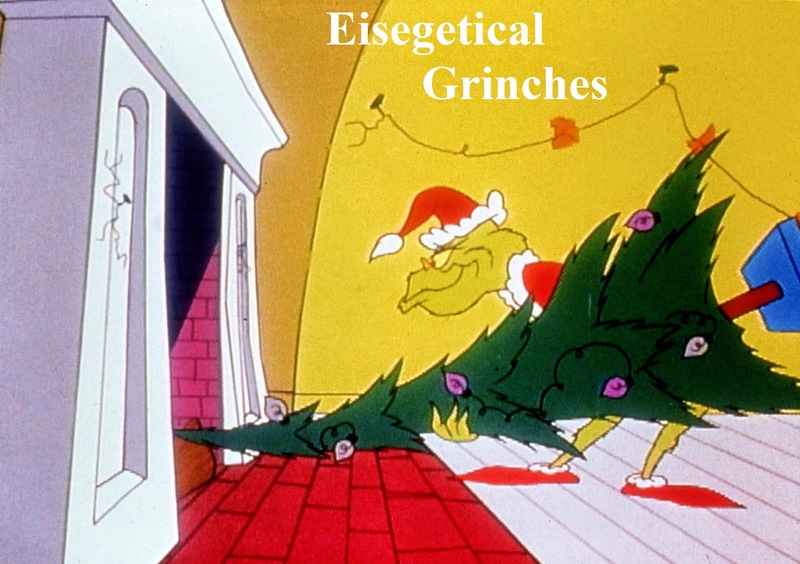 I've titled this article "Eisegetical Grinches" because there are well-meaning, Christ-loving, Bible-believing Christians who subscribe to the idea that the celebration of Christmas is demonic and sinful. There are soundly saved folks who cannot seem to keep themselves from doing their level-best to admonish their Christian brethren to remove their from their homes all wreathes, mistletoe, and those Nativity scenes that include the historically and biblically inaccurate presence of three "wise men." And the tree. "Oh!" They demand. "Begone pagan representative that now can be purchased with the lights already strung!" Thank you so very much to whoever came up with that gem of brilliance. He or she has saved me quite a bit of time and energy over the last several years. And to you evergreen purists out there, I laugh in your general direction. Now, it is important to note that in painting a word picture of a Christian Grinch, I am not suggesting that every Christian who refrains from bringing a tree into their home and decorating it is a Grinch. I am not suggesting that every Christian who does not involve themselves in extra-biblical holiday traditions is a Grinch. On the contrary: some of my brothers and sisters in Christ who do not participate in the traditions of men at Christmas experience as much joy (or maybe more) than those of us who do participate. And to that I herald the timeless words of Dickens' Tiny Tim, "And God bless us everyone!" So, I've covered the "Grinch" part of this article's title. But what about the "Eisegetes" part? "The act imposing meaning onto a text and is often described in terms of reading "into" the text rather than "out of" it. Therefore it is the opposite of Exegesis." Grinches (again, I'm talking about only those Christians who do not participate in Christmas and impose their preferences upon other Christians) perform eisegesis on a particular passage in the Bible, in an attempt to justify their personal prohibitions regarding Christmas trees. Then, they try to use the same passage as an "AHA!" sledgehammer to try to convince those providing December foster homes for trees that, in doing so, they are sinning. The passage is Jeremiah 10:1-10 (KJV). Let's look at it in its.....wait for it.....context. "Hear ye the word which the Lord speaketh unto you, O house of Israel: Thus saith the Lord, Learn not the way of the heathen, and be not dismayed at the signs of heaven; for the heathen are dismayed at them. For the customs of the people are vain: for one cutteth a tree out of the forest, the work of the hands of the workman, with the axe. They deck it with silver and with gold; they fasten it with nails and with hammers, that it move not. They are upright as the palm tree, but speak not: they must needs be borne, because they cannot go. Be not afraid of them; for they cannot do evil, neither also is it in them to do good. Forasmuch as there is none like unto thee, O Lord; thou art great, and thy name is great in might. Who would not fear thee, O King of nations? for to thee doth it appertain: forasmuch as among all the wise men of the nations, and in all their kingdoms, there is none like unto thee. But they are altogether brutish and foolish: the stock is a doctrine of vanities. Silver spread into plates is brought from Tarshish, and gold from Uphaz, the work of the workman, and of the hands of the founder: blue and purple is their clothing: they are all the work of cunning men. But the Lord is the true God, he is the living God, and an everlasting king: at his wrath the earth shall tremble, and the nations shall not be able to abide his indignation." Now, if we look at the passage through the eyes of the Grinch, you may tilt your head, contort your lips, widen your eyes (you just did all that, didn't you?) and feel some compulsion to say, "They may have a point." Cut down tree (10:3). Check. Deck it with silver and gold (10:4). Check. You're not alone if you just pictured Burl Ives as the snowman in "Rudolph the Red-Nosed Reindeer" singing "Silver and Gold." If you want to get that song out of your head, just think of decking the halls with boughs of holly. Sorry. Had to do it to you. Fa-la-la-la-la-lala-la-la. Fasten it with nails (10:4). Check. We're more civilized thees days and don't nail real trees directly into our almost-real-looking laminated floors, but we do fasten them in one way or another to keep them upright and stationary. To the Grinch, if the above doesn't describe a Christmas tree, well, he doesn't know what does. The Grinch doesn't like Christmas trees. He wants to rid the world, certainly Christian homes, of Christmas trees. Why? He believes they are pagan and idolatrous. Now, what Bible-believing, Christ-loving person would want to blaspheme God through idolatrous practices? You? No. Me? Uh-uh! No way! The Grinch would have an ironclad case against the Christmas tree, but for one.....small.....problem. The passage in question has nothing whatsoever to do with a Christian bringing a tree into his or her home during what is commonly referred to as the "Christmas Season" and decorating it. Even a cursory observation of the text shows us that. The Lord, through Jeremiah the prophet, is speaking to Israel (10:1), not to Christians. The first audience of the prophesies given to Jeremiah would have had no clue what a Christmas tree was. They would have tilted their heads like curious puppies at the mention of the word "Christmas." The sin, the offense against God, committed by the people of Israel was not the cutting down of trees and decorating them. The violation of God's law by God's people was the blasphemous worship (idolatry) of the trees they cut down and decorated. If Christian Grinches had police powers and were able to obtain and execute search warrants of Christian homes, in search of Christians worshiping Christmas trees, they would not make a single arrest. Oh, they would find plenty of Christmas trees. But they would find not a single Christian worshiping a decorated tree. I've never talked to my Christmas trees. I've never asked my Christmas trees questions. I've never prayed to my Christmas trees. I've never beatified or deified any of my Christmas trees. I've never offered sacrifices to my Christmas trees. I've never rubbed the trunk of any of my Christmas trees anticipating that a squirrel genie would jump out and grant me three wishes. I've never worshiped a Christmas tree. I will never worship a Christmas tree. I've never met a Christian who worships Christmas trees. And I never will meet a born-again follower of Christ who worships Christmas trees. This, on the other hand--well, this is tree worship. Jeremiah 10:1-10 is a prophetic warning to the people of Israel to stop committing idolatry against the Lord God. The trees mentioned in Jeremiah 10:1-10 were objects of idolatry. Jeremiah 10:1-10 is not about Christians putting up and decorating Christmas trees in their homes. Having a Christmas tree is not idolatry. Worshiping a Christmas tree is idolatry. Christians don't worship Christmas trees. Pagans and other unbelievers of various stripes might worship Christmas trees. I'm guessing the emotionally unhinged, never-let-these-folks-babysit-your-children-kind-of-people in the above video might worship Christmas trees. It's okay for Christians to choose not to have a Christmas tree in their homes. It's okay for Christians to have Christmas trees in their homes. Neither group of Christians should impose their preferences regarding Christmas trees on the other group. Christians are not commanded by God, in the Bible, to memorialize the birth of Jesus. Christians are not forbidden by God, in the Bible, to memorialize the birth of Jesus. You can have a Christmas tree and still love Jesus. I wonder if the same Christian Grinches the eisegete Jeremiah 10:1-10 blow the same gasket when some Christians and Preachers eisegete Jeremiah 29:11? as usual you take a sensitive topic, make it easy for folks to understand and you lovingly instruct others on how they should consider the issue at hand. Thank you. You have correctly stated that "Neither group of Christians should impose their preferences regarding Christmas trees on the other group"
As it pertains to individuals and households, everyone will have to stand or fall before his master. However, in the context of a public commentary, I think that an opposing viewpoint concerning matters of worship and Holy days should be brought forward for the saints to consider. "Christians are not commanded by God, in the Bible, to memorialize the birth of Jesus." "Christians are not forbidden by God, in the Bible, to memorialize the birth of Jesus." 1. What God commands, we are to do. 2. What God forbids, we are not to do. 3. What is not commanded or forbidden, we do according to the light of nature and good order (1 Cor 14:33, 40). 3. What God does not command or forbid, we do not do. This view holds that there are three ways in which the bible reveals God's commands/imperatives. 1. Direct commands (You shall not steal). 2. Approved examples (Rahab and the two spies). 3. By good and necessary consequences/inference (Do not muzzle an ox while it treads out the grain). Undergirding this viewpoint, is the understanding that the bible is sufficient to teach and speak on all matters of faith and life because it instructs men and nations principally (2 Tim 3:16-17). In other words there won't always be a chapter and verse that explicitly demonstrates a commandment of God. From this viewpoint, as with the contrary viewpoint, the text in Jeremiah 10 clearly teaches on the sin of idolatry against God and does not directly speak to the issue of Christmas trees and the memorializing of Jesus Christ. In fact the use of this verse as a proof text against Christmas in general, misses the whole point of why Christmas should not be celebrated by Christians. In conclusion... Applying the RPW to this issue, we can understand what the bible teaches us concerning matters of worship, which in turn informs our understanding (principally) of how we are to discern the so called "holy days" in our day. 1. God is the only one who ordains all Holy Day remembrances concerning his worship and he also prescribes the details of how that worship is to be performed (Exo 25-31, Lev 23, Num 28:1-6, Jer 7:31, 19:5, 32:35). 2. It is forbidden for man to worship God apart from God's revealed prescription for the worship of Himself (Lev 8:35-36,10:1-3, Num 12:1-10, 16:1-40, 20:1-13, Deut 4:1-2, 12:32 Isa 1:11-20, Matt 15:1-9, Luke 17:7-10, Act 17:24-25). 3. All worship of God by man's autonomous human reasoning is idolatry (Deut 12:1-32). 4. God has not ordained the Holy day of Christ mass or Easter, and neither has he prescribed anything concerning the memorializing of Jesus Christ's birth, death, or resurrection apart from the Lord's day Christian Sabbath and the sacrament of the Lord's Supper. 5. God has set apart and ordained the Christian Sabbath, commonly called the Lord's Day as an Holy Day (Exo 20:8-11, Acts 20:7, 1 Cor 16:1-4, Matt 5:17-20). 6. On the Lord's Day, he has prescribed the sacrament of the Lord's Supper/communion as a means of grace restoring the saints to himself in sanctification through the power of the Holy Spirit in proclaiming the Lord's death until he returns when they "doing this in remembrance of me" (1 Cor 11:23-26). The word of God forbids us to celebrate Christ mass and Easter because God has not ordained or prescribed these so called holy days. Therefore we do not do it. If we do it, we are in danger of incurring his wrath (Deut 28:15-68). It must be understood that from the perspective of the RPW, all commands of God, whether explicit, implicit, and/or by principle, are binding to all men as if by direct command (Deut 4:1-2, 12:32, Matt 5:17-20, 15:3-6). This is only a counter perspective given in the spirit of iron sharpening iron, with no ill will or malice.